In the early 90s I was the drummer for the reggae band Sasquash, and prior to that the ska / punk / reggae band Funzig. But I had been collecting vinyl since I was eleven years old; buying anything reggae style I heard on the radio: Specials, Madness, Eddy Grant, Musical youth and of course, Bob Marley. This inevitably lead me to King Tubby and Lee Scratch Perry… That was IT for me! Pure joy! I loved introducing people to the feelings the music gave me; and so I played my records to anyone who would listen. At this early stage Operation Sound System played free outdoor and house parties: just about anywhere that would let us string the boxes up and play. Learning quickly and working hard, OSS established a reputation for good vibes, heavyweight sound and conscious selections. This paved the way to some big shows such as Band on the Wall Manchester, Don Valley stadium Sheffield and most notably, the now legendary dances held at Tony’s New Empress Ballroom in Blackburn. These truly memorable dances were regularly attended by three or four hundred people with some big names passing through. It was mostly whilst playing this venue, but also wherever else possible, that OSS developed our signature sound and operating style. These dances even continued when the band Sasquash sadly disbanded, and Operation Sound underwent a period of instability as crew members came and went. But worse was to follow when later, the Ballroom was sold. Dances stopped and the sound was left looking for a home. However, OSS had started to to be noticed nationally after a series of high profile ‘sound meeting’ in ’98 and ’99. After these it was obvious that ‘the roaring lion sound outta Blackburn’, or as people now started to name us: ‘The Northwest Heavyweight’, was clearly a force to be reckoned with. In the following years we were fortunate to be invited to play dances and sound meets all over the UK, from Plymouth to Glasgow. OSS released its first vinyl, ‘Rally Round’ with Daddy Teacha, to much acclaim in 2004. This quickly became one of the best selling UK roots records of the year, again raising the profile of the sound not just in the UK but for the first time overseas. 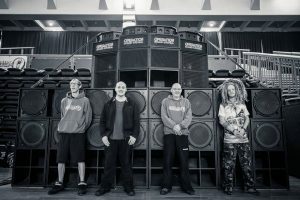 Playing venues such as Sub Dub Leeds, Dub Central Sheffield and others, now on a regular basis, Operation Sound continued to grow, progress and tour the UK. Releasing the next 12’’ EP “Righteousness”, with upcoming roots singer Jah Mikes, in 2006 OSS again received a great reception and great reviews. I rebuilt the original sound after 11 years on the road, new boxes and a new pre-amp were needed and it was hard work and expensive. However, somehow I found enough money to rebuild and proudly let the new sound loose in March 2007. From that date to this we have never looked back. The sound has never once disappointed or let us down no matter where, or who the competition. Entering the 2009 Jah Works Roots & Culture Unification Dub Cup, Operation Sound was finally eliminated only after a very, very close run musical battle with the eventual cup winner King Earthquake. Hundreds of sessions with the sound system have since followed. Our recent vinyl releases with Alexia, Don-fe, Prince Jamo, Daddy Teacha and Ricky Grant have been very well received, with worldwide positive acclaim and reviews. Operation play dances in all corners of the UK & Europe. Here are a few things other’s have to say about Operation….